The Aramith Tournament Pool set is the new generation featuring the Duramith technology. The Duramith resin formulation, with its hi-tech engineered molecular structure, further enhances drastically the longevity of the Aramith ball sets while minimizing significantly table cloth wear. 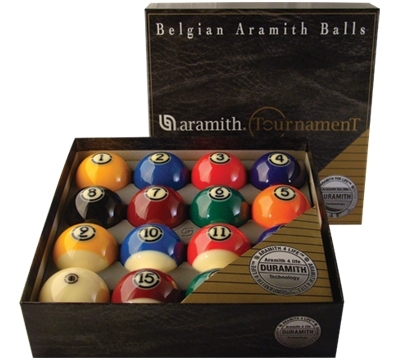 With a life-time that exceeds up to 8 times that of the average polyester and phenol-like resins, reaching easily up to 40 years in residential use, Aramith ball sets are the logical choice for both the trade and the player. Regulation size (2.25") and weight; includes a 2.25" cue ball. •Their through-hardened vitrified surface and core holds their glossy look. •Rebound and playing consistency throughout the set is maintained all along. •Cloth wear and white marks that so easily ruin the look of the table are minimized. •Their friction resistance minimizes burn spots.